The following is from Brandon Walsh of Robertson+WalshDesign. 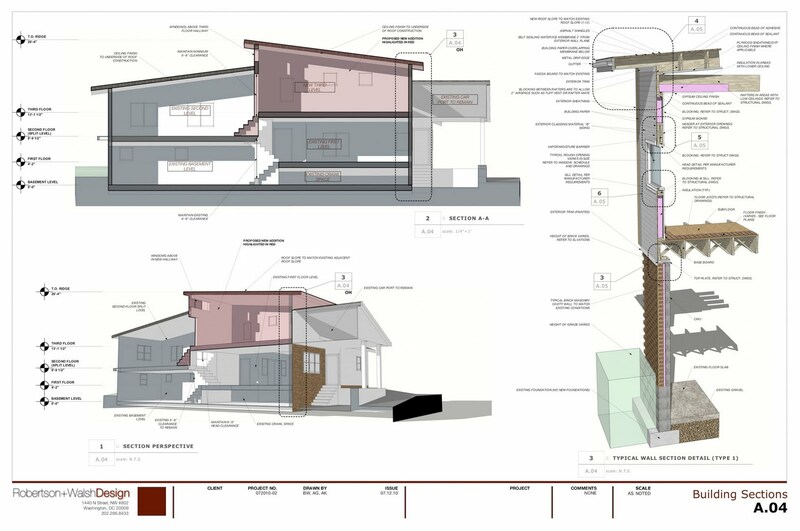 A new SketchUp Pro user, Brandon provides some outstanding documents, all created in LayOut, showing the power of the software and the advantage it gives him due to its seamless integration with SketchUp. I started working with Aaron Gasper and Andrew Kroh; they were the ones who encouraged me to work entirely in SketchUp Pro. We started work with LayOut on July 5th (right after the holiday) and by July 23rd we were fine-tuning the 95% set for permit. Within one month, we learned how to create a construction model in SketchUp (not just a loose design model,) learned LayOut completely, and printed the permit set. It was approved in September. 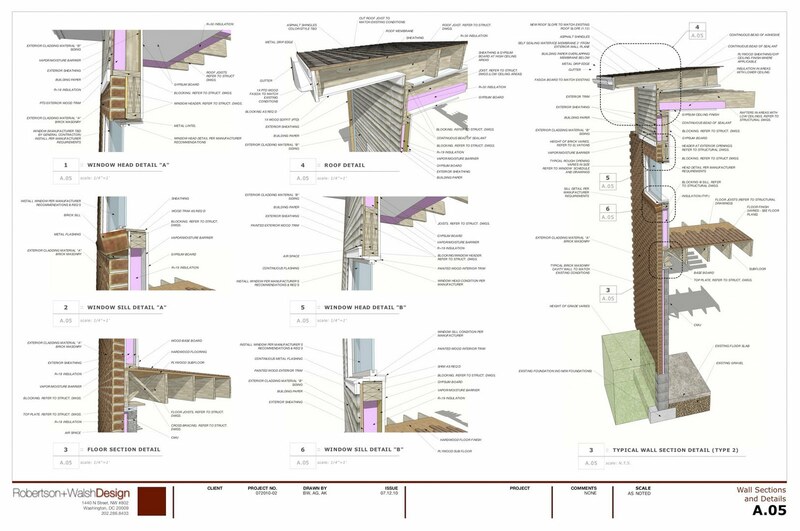 SketchUp Pro has proven to be very fast, effective, and frankly a better program when it comes to both designing and documenting projects – and we’ve figured out this program in less than a few weeks. We're going to throw CAD out the door! The process of labeling and dimensioning in LayOut was far superior to CAD; was easier to see and faster to complete for us. There's no way we'll be picking up any of the typical CAD software again any time soon – we'll be using SketchUp Pro. Any engineers we work with will receive exports right from our SketchUp model. It works beautifully. Our documents have led to requests from contractors to do 3D imaging of projects they're working on. Being able to see things in 3D helps clients understand interior spaces, which in turn helps them make decisions so things can move forward. SketchUp Pro is going to help grow our business significantly: On our next project, we’ll be creating a model, turning it into drawings, and setting up a “construction site laptop” that everyone can reference during construction. We can do things faster, communicate ideas more easily, create a better construction drawing set, and complete our projects more efficiently by referencing the model directly. Contractors will be able to navigate the model easily; we’ll create saved views that correspond to what they'll need. Clicking on the scene tabs is all they’ll have to do to get the relevant information. If I'm not mistaken, this is a form of Building Information Modeling – having the model on a laptop on site is going to be fantastic. Thanks for your enthusiasm, Brandon. Congratulations on some really amazing work in LayOut. Update: Brandon Walsh has published a terrific comment on this post's comment thread. Well worth reading. Incredible. I'm an Interior Design and Decoration student that uses SketchUp for my own small projects, nice to know I can implemeent it as a serious program to get the job done. These plans are seriously amazing. I think it would be really cool if Google created a feature video with Brandon Walsh of Robertson+Walsh Design with some scenes in the design office and using SketchUp during design meetings and even showcasing to the client. 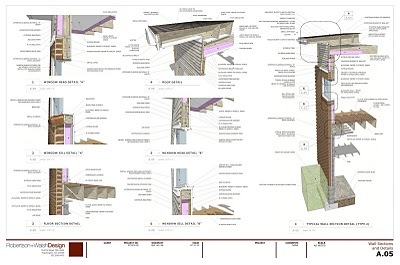 Lets see Detailed drawings for other professions,Structural,M&E,Interior,Landscape Design.... the list goes on. These are really great. thanks for posting another great example of how to use sketchup and layout in a professional setting. These are truly inspirational. So did they model the entire framing package? Or just added what is needed in each wall section cut from the model? So called construction details with no dimensions? A bit time consuming to measure the model as you go. Good luck! Seriously, mr. Joe? I don't know what kinds of construction docs you look at, but by the time you reference the details your framing and everything is already in place. What are you looking for, dimensions of the exterior sheathing? Insulation? Drywall? No. They are what they are. Are you looking for the dimension of the window? No - standard manufacturer install. You must have a heck of a time building houses. For dimensions you usually reference floor plans, building sections, etc. Anyway, these are fantastic drawings and great examples of how you can use 3D representation to pack a lot of information in just a few drawings. As a contractor, I can see how much easier it would be to understand how everything is supposed to come together and I'd have a better idea of what the finished product is supposed to look like. Friends of mine work for a larger constuction company that builds models like this regardless before they start the job to prevent mistakes during construction. It's saved an unbelievable amount of time and money. I've been just starting to do the same using sketchup - which is why I scan this site to look for what firms are up to. So, I congratulate this guy for an outstanding construction model and would be excited to see how much of a benefit it would be having the model on site to see what the build out goal is. I can tell you first hand how much time it would save in coordination and contractor understanding how everything goes together. Beautiful drawings - very inspiring. REally great ideas here...I have to give Layout another try. I'd like to see a dimensioned floor plan to go with these. Nice work. I take it that the sections were drawn as sections and not taken from a model of the house? I ask because I am not aware of whether the Section Plane function lets the material surface finish wrap the ends of elements such as joists, bricks, siding etc. If someone knows how to make the sections solid using the section tool can you please point me to a tutorial or something? This is Brandon (Walsh) of Robertson+Walsh. I thought I'd check in on the article and am flattered to see so many comments. thank you for all the kind words. Frankly it's been entertaining to develop what we see as a new way of conveying information to contractors - packing more into one drawing and since things are in 3D there's a lot less guess work and coordination calling/emailing. Anyway, you are correct. The detailed wall sections are separately drawn with components that we've created in our construction library so that there aren't "hollow" which would cause confusion. this is something sketchup can work on as toggling as an option with the section tool actually. Also note the more familiar "2D" components such as "X's" in the blocking to convey to the contractor that it is, in fact, just blocking. At a certain point, you have to draw the line as to where you stop detailing the overall model and start using your component library to build more detailed models - otherwise you're in for too much work when it comes time for a change in the design. We reference the overall model constantly so the changes show up in the detailed models as outlines so we know where changes occur. We're developing a process where we take a schematic design model, save it at the end of that phase and archive it, then continue to follow suit through the end of the design phase. when we build the construction document model it's really the "construction model" that we use on site with the contractors. Before even starting construction, we'll meet with the contractor and walk him thru a series of short clips detailing the construction of the project. We'll let he/she tell us if they want any additional images produced from the model, too. 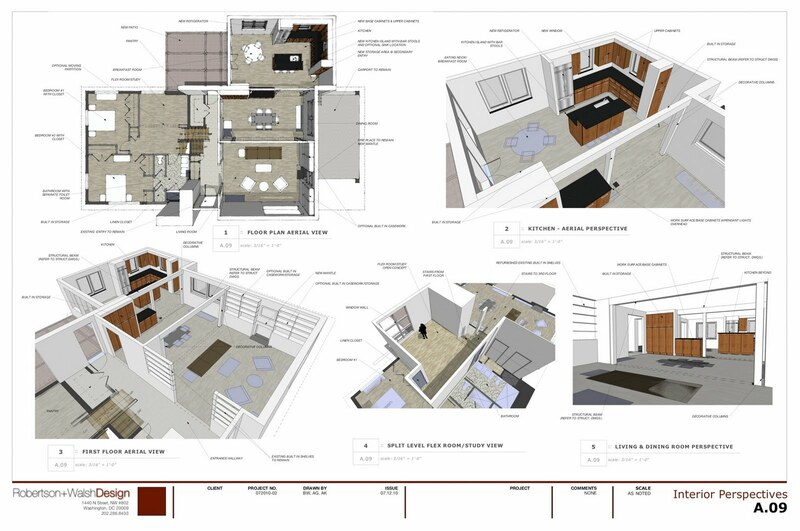 Last project we saved significant time during construction by showing the design in 3D and how all the different parts come together - even down to the kitchen island design. We're finding constant advantages to the sketchup model. Just yesterday we saved one of our clients almost 20% in facade materials cost by performing a quantity take off from the model. that money will be used to go elsewhere in the home - perhaps into upgrades in the kitchen or bathrooms. The true test will be at the end of the installation of the facade material to see how much left over we have! Even after the construction model and it's use for coordinating digging holes and hammering nails, we use the model to produce fantastic marketing images. In the end it all came down to one model that produced all the drawings, was on a laptop on site for construction, and was used for marketing. It's amazing to me. From this experience, we just convinced a developer we're working with to allow us to build a construction model of a project he had already drawn up and designed by another architect (we're a contractor, too). We're building the project and the drawings are quite poor. so this is going to save us a lot of time & coordination headaches - and more importantly allow us to stay ahead of schedule. we started with the foundation yesterday and are going to construct the model piece by piece ahead of the construction schedule. in the end we'll have a fully detailed scale model of the building that helped us through construction. very excited about it. For everyone else asking for more drawings, yes, these are only a few of the drawings in the set portrayed in this article. we have detailed plans, site plans, etc. if you'd like to see them I'd be happy to email them to you for your reference. just contact me at brandon@robertsonwalsh.com. It would be really interesting to see what you did in Layout v Sketchup and potentially the use of layers. I'm currently in the process of migrating CAD files to Sketchup and am challenging about how to integrate difference shading and line colors to replicate the CAD drawings. Any pointers on this topic would be greatly appreciated! Easiest way to "grey out" the architectural plans and place electrical symbols or plumbing diagrams on top in layout (which is what I do) is to save a scene in sketchup of the plan view you want with the lines grey - and whatever thickness you need (and layers toggled to what you want to see). insert the model view in layout of the sketchup model, and select the scene - then place the symbols and adjust line wt, shades, etc. of what you are drawing in layout. I use the scrapbook to keep all my electrical symbols, plumbing symbols, etc., etc. it's very fast. It's crucial to know what to put in layout and what to put in the sketchup model and have them work harmoniously. Makes lots of sense - kind of like using Sketchup for the "line diagram" and "coloring in" with Layout - correct? Anything you are willing on what goes in sketchup and what goes in layout would be greatly appreciated! Yes, this is the way to go. I keep thinking that we need to rethink how to truly use the computer instead of replicating the old 2d line work drawings, we can truly have a "digital job site". Now if only the building department would let me submit plans this way.. These drawings are awesome, and a great example of what SU Pro is capable of. I look forward to the day when we can use 3D model views for most of our construction documentation. Hope this isn't too much sleazy marketing! Let me know if anyone needs to know more. Cheers.